Innovative Seatings Pvt. Ltd. (ISPL), is a leading manufacturer and supplier of Seating Solution and Furniture for Auditorium, Cinema, Multiplexes, Theatre, School / Collage Auditorium, Corporate Auditorium, Stadium Seating, Recliner, etc. Our wide range of product includes Recliner Seating, Auditorium Seating Chairs and Cinema Seating Chairs. 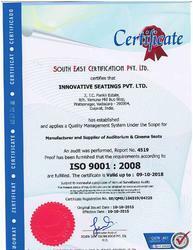 The company is ISO 9001:2008 certified with installed capacity of 4000 seat sets per month for auditorium seating & 20,000 seats set per month for stadium seating. ISPL was established in 2007, promoted by financial & technically qualified technocrats with over 25 years experience in seating industry. ISPL is well organized company having dedicated team of professional expert staff with a modern office set up in Baroda, in Vibrant Gujarat. We have an organized department with synergy among related other department like Finance, Operations, Consultancy, Marketing, Research & Development, Quality Assurance, Logistics, after sales service, etc. Our R & D department always considers & works for the innovation & improvement of our qualitative products which are always backed by Marketing Research feedback about Prices, Colors, Quality and above all aesthetics of our products. We provide wide range in what best is available in each segment with available standard design. An option is available in each of our product catalog. We have technical drawing department for each of our products, where parts are identified by drawing number systems to trace easily. Due to this our client can order their spare requirement easily. Financially, our company in supported by Central bank of India, our company has proven track record of growth with many successfully completed projected and assignments across india. The varied technical expertise of our leader Mr. Rajesh Panchal (Director) serves as the driving force behind our production efficiency. His leadership equips us to hold positive improvements in our brand image by delivering much-anticipated product range. Manufacturing and Trading of Seating Solutions and Formworks. We are supported by adroit team of professionals, who work according to expectations and preferences of our renowned clients. The professionals who are working with us are recruited after the examination process and also on the basis of their experience and knowledge in their specific domain. We also have divided our team in various departments like manufacturing, quality testing, warehousing & packaging and sales & marketing. By utilizing the experience and knowledge of our professionals, we have achieved the praiseworthy position in the industry. Also, we organize various seminars and training sessions on the regular basis for our team. For close to a decade, our qualitative range of products are being used extensively in auditoriums, cinema halls, multiplexes, concert halls, stadiums, colleges and residences across the world. We are a client-centric organisation that believes in sustaining long term bonds with the clients. Our experienced workforce, blessed with vast market knowledge and expertise, are catering to demands of clients within stipulated time frames. We have clients located in South East Asia and Middle East Asia. We have a dedicated team of professionals operating out of a modern office set up in Baroda, in Vibrant Gujarat. This unit is integrated with latest technology systems and machinery. Various departments such as Finance, Operations, Marketing, R&D, Quality Assurance and Logistics work in harmony and complete consignments without any hiccups. Our R & D unit works towards the innovation of our products. Our marketing experts research feedback about Prices, Colours, Quality and above all aesthetics of our products. Since we export to various parts of the globe, our Logistics staff works overtime to ensure flawless deliveries.